You can never be sure which beer in a brewery's armoury is going to become the one beer lovers will take most to their hearts (although it seems barrel aged beers or high ABV hop monsters stand a good chance). 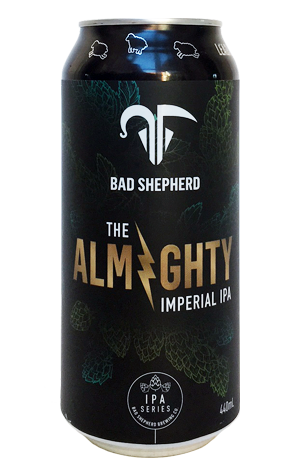 For Cheltenham's Bad Shepherd, while the Hazelnut Brown caught eyes early on, there's a good argument for it being this beer, its once-a-year imperial IPA that even gets its own special launch day at the brewpub. There's good reason for its cachet too, as it's a beer that's as tightly wound as it is hopped up and booze-laden. In 2018, it comes in rather schmick looking cans and continues along a similar path to last year, namely bright as a button to look at (far more so than pretty much any pale ale or IPA you see these days), peachy, limey and grapefruity on the nose, light-footed for its size, and with little in the way of malt sweetness to get in the way of the hop flavours yet enough to keep the almighty IBU [International Bitterness Units] well in check.